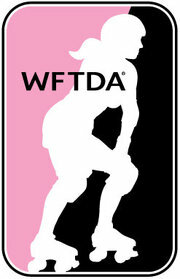 NEWSFLASH: CCR graduate to become full WFTDA Members!! 1st March 2012 Central City Rollergirls are thrilled to announce that the league has successfully graduated from the WFTDA Apprentice Programme and are now fully fledged WFTDA Members! Having joined the WFTDA Apprentice Programme in July 2011, CCR have gone hell for leather to prove their worth and have graduated just 6 months later with ringing endorsements of the way the League is run, structured and helps spread the Derby word this side of the Atlantic. CCR become a Class B League being placed in the WFTDA East Region joining the our old friends the London Roller Girls andAuld Reekie Roller Girls as the other UK representatives in that region. We’d like to put on record our sincere thanks to Pepper Grind’her of the CTRoller Girls who has been an awesome and totally supportive WFTDA mentor, to Ms Dfiant & the Angel City Derby Girls for their initial recommendation and continued support, to the Sioux Fallz Roller Dollz for popping our WFTDA Sanctioned bout cherry to help us on our way and finally to the London Roller Girls, especially Bette Noir and Slice Andice, for their support and endorsement throughout our attempts to become WFTDA Members. Our aim now is to live up to the expectations of being a WFTDA Member League, and hope us joining helps push the cause of Roller Derby in the UK and Europe further. The WFTDA European region can’t be too far round the corner can it? !